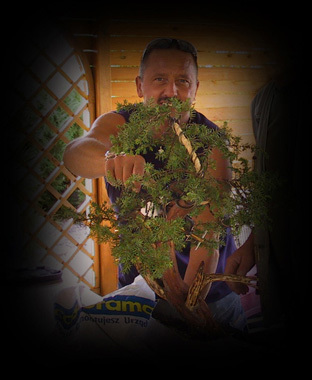 My name is Roman Bona and I've been involved with the art of Bonsai since 1991. My interest was sparked after joining a club here in my I hometown of Limburg, Germany during which, in 1999, I became involved with Juergen Zaar. From his design, technique and ideas I became ever more fascinated in this art form. During the next few years I had the chance to work closely as a team with Juergen in his studio Kirei na en in Cochem, Germany along with Joerg Derlien. That work consisted of learning wiring technique as well as basic design theory and practice. The three of us grew ever more closely as a team. During the European Convention (EBA) in France I had my first chance to assist Juergen along with Joerg during a demo. Next, came the Polisch Bonsai Congress in Ksiaz and then, the European Bonsai Gala in Bad Staffelstein, Germany. After that demo, we were praised by the Japanese demonstrator Tokita for our outstanding technique and we were asked if we could assist him during his demo. An article about this demo was published in the Japanese magazine Kinbon Bonsai. Much credit must also be given to the helpful encouragement from my wife as well as the hard labour of my son which has also not gone unnoticed. In designing a tree, I am often accompanied by the music of Pink Floyd which fascinates me almost as much as Bonsai. During 2006, I participated in and won the New Talent Contest in Germany and have qualified to participate at the European level in Belgium at the European Bonsai Association (EBA) during 2007. Since the past two years I have also been giving workshops in my home country of Poland as well as Germany. Currently I am active in providing workshops internationally as well as demonstrations to the open public.